Caption : TAMBARAM, 02 MAY 2007: Once the Rs. 32.6 crore Water Supply Improvement Scheme is implemented in Tambaram, scenes like these might become a thing of the past, hopefully. 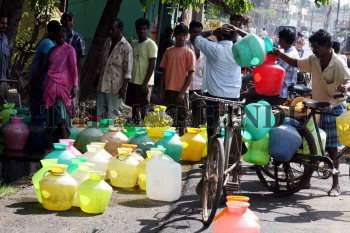 Residents scramble for water near the pumping station on Mudichur Road on May 02, 2007. Photo : A_Muralitharan.